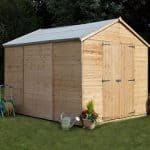 The 7’ x 5’ Tongue and Groove Offset Apex Shed combines the quality construction and practical features of a traditional garden shed at a great price. 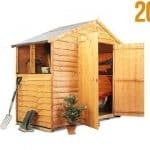 The 7’x5’ interior makes this a medium sized shed that is ideal for all of your outdoor and garden equipment. 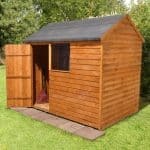 This is a 7 x 5 apex shed. One of the key features of the building is the apex roof. This provides an enhanced level of head height, which means that if you have larger and taller pieces of equipment, this should not be a problem.The roof itself is made from 8 mm solid sheet board, which brings extra durability to the building. The cladding around the building is 40 mm shiplap tongue and groove. This cladding material is extra durable, and interlocks so you have extra protection against rain. 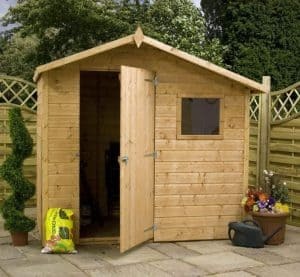 The building comes with a 10-year anti-rot guarantee as standard.This medium-sized shed is ideal for the average household’s outdoor and garden equipment. Built-in shelving and/or free-standing storage could be added to create additional storage space and take advantage of the 7ft roof height. This would be particularly useful for storing smaller items, freeing the 7’x5’ floor area for larger pieces of equipment. The Offset Apex Shed is an excellent product but what makes it different from any other traditional wooden shed? 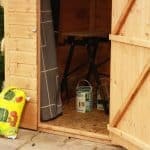 In this section we discuss the different features that this shed has to offer, along with ways in which the space can be maximised to provide the ultimate storage solution for your garden. Exterior: The shed exterior is typical of a traditional wooden shed, with 14mm tongue and groove cladding and grey sand felt roof covering. As in the product’s name, the ‘offset’ describes the way in which the door and window are placed to one side on the front of the shed. The shed uses high quality construction to keep the contents inside dry, secure and free from damp, mould and rot. Interior: This medium-size shed has a 7’x5’ interior space that provides adequate storage for the average household’s outdoor and garden equipment storage. The Apex roof gives the interior a fantastic 7ft height, allowing even the tallest member of the family to stand up comfortably inside. Windows & Doors: The Apex shed has a single door and a small window to the front of the building. The size of door is adequate for the medium-sized shed and will allow easy access for small to medium sized items. The window is made from 2.5mm styrene glazing and is small – an ideal size for security reasons but also allowing enough light into the shed to maintain a favourable environment for storage. 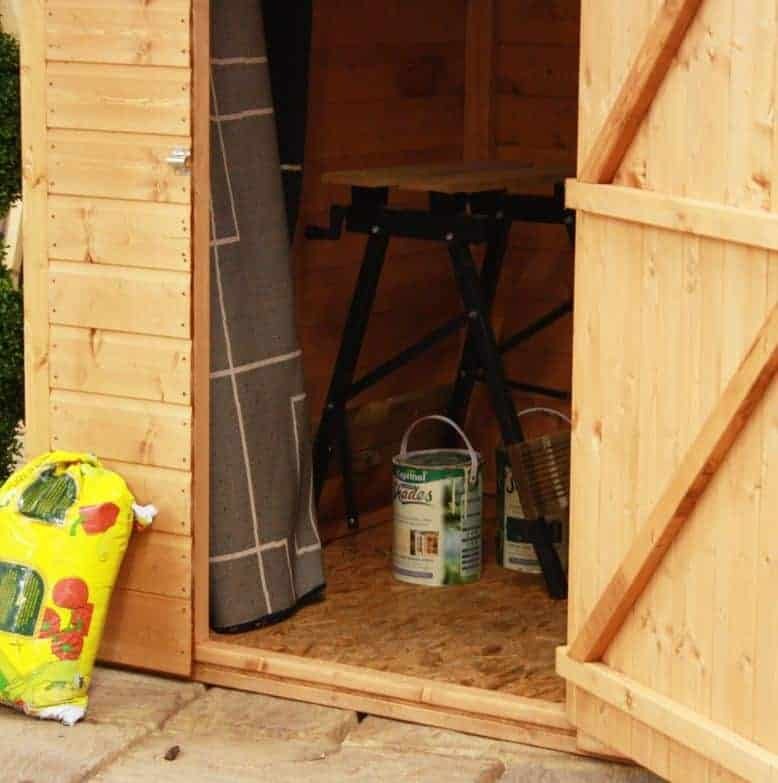 Security: The shed comes complete with a pad-bolt, which not only ensures that the door stays firmly shut, it also allows a padlock to be attached for security purposes. A padlock may be purchased separately for a modest price. 7’ x 5’ Tongue and Groove Offset Apex Shed: How easy to build? The assembly process for the Apex shed is made as straight-forward as possible for the customer with the aid of the comprehensive instruction manual provided. This contains easy to read instructions in a range of languages, as well as clear diagrams to keep you on track every step of the way. As with any larger item requiring assembly, it is recommended that two people work together on construction for safety reasons as well as efficiency. The product will arrive directly to your door in flat-packed form, in a package containing all of the panels, roofing, fixtures and fittings required for assembly. A home installation service is also available at an extra cost. 7’ x 5’ Tongue and Groove Offset Apex Shed: What is the overall quality like? The Apex shed is constructed from 14mm tongue and groove cladding, giving strength to the structure and weatherproofing the exterior against the elements. The timber is of a high quality and carries a 10-year anti-rot guarantee from the manufacturer, providing it is kept well-maintained during this period. The roof uses a sand felt covering to protect the shed from rainwater and against the elements during its lifetime in the garden. 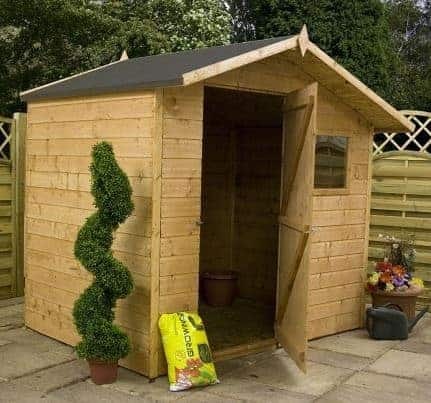 Although the shed comes complete with a floor, it is recommended that the building be placed on a level base to give the shed a solid foundation. If no suitable area is available then a shed base is available to purchase as an optional extra during the purchase process. 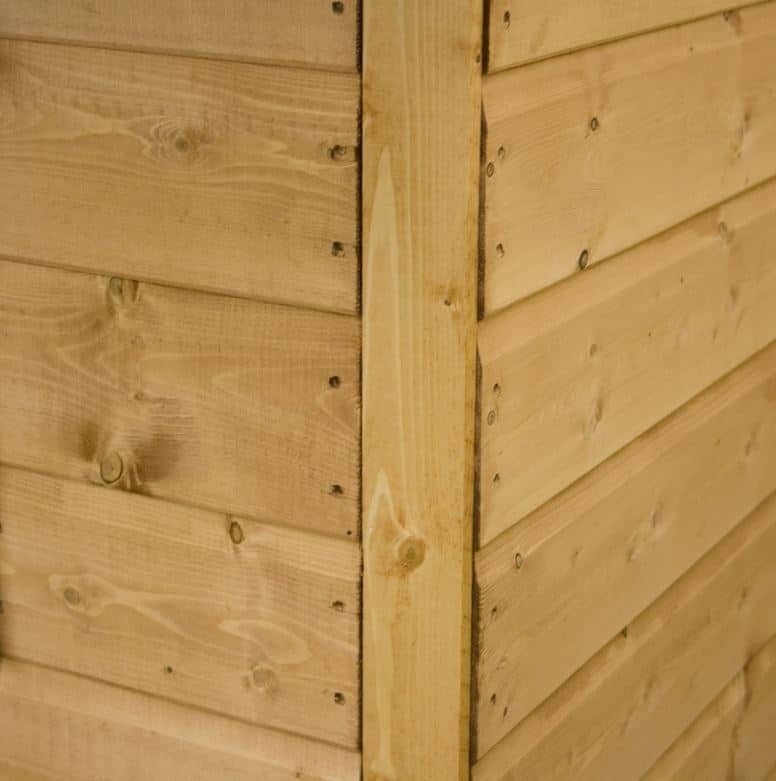 A range of wood treatments are available in four different colours at a small cost should you wish to personalise your shed a little further, or have it treated to match existing pieces within your garden. 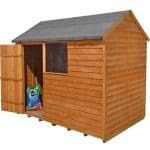 The 7’ x 5’ Tongue and Groove Offset Apex Shed gives you the opportunity to buy a high quality wooden shed at a fantastic price. 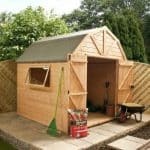 The model doesn’t offer anything different to other similar sheds and there are no fancy features, but you will definitely be drawn to the price; you certainly get a lot of shed for the money. This highly practical shed will enable you to store your outdoor and garden equipment in a natural wooden shed that will blend into your garden. A great value product!